About us Chenghe represents the brand of the fashionable and stylish sports shoes and apparel suits, due to our stable supply channel. We have obtained trust from vast customers with the excellent quality, fair price and sincere service attitude. And now we focus on not only women clothing but also fashionable shoes. Hope you enjoy purchase at our store. Note 1. The actual colour of the shoes maybe different from the picture shown due to the different screen of display or reflecting light when shooting. 2. Package include: 1 Womens Shoe. 3. It's can't avoidable that you will receive the shoes with some smells from original material as it's new. 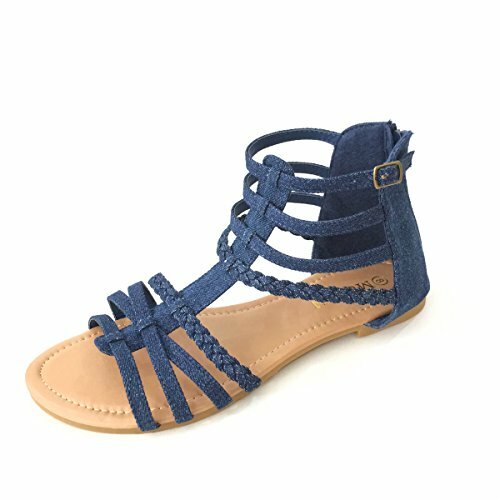 ▲Trends The colors of our women's sandals draw on fresh summer trends. 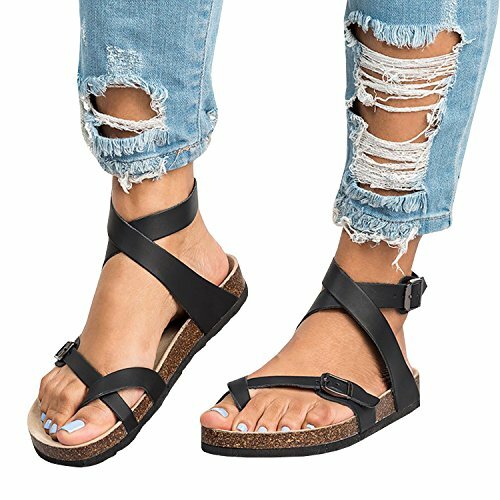 Black or Coffee, Whatever you choose, this pair of gladiator strap flat sandals willbecome the best compliment to all of your looks. A quiet minimalist and classic design lets you enjoy those warm days in the summer to their full effect. 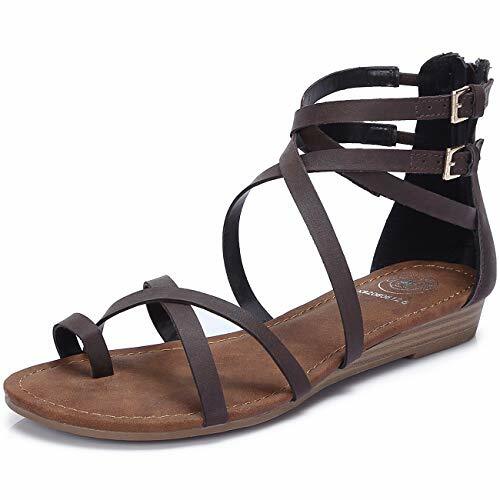 ▲Occasions These lightweight sandals compliment any casual outings to the office. 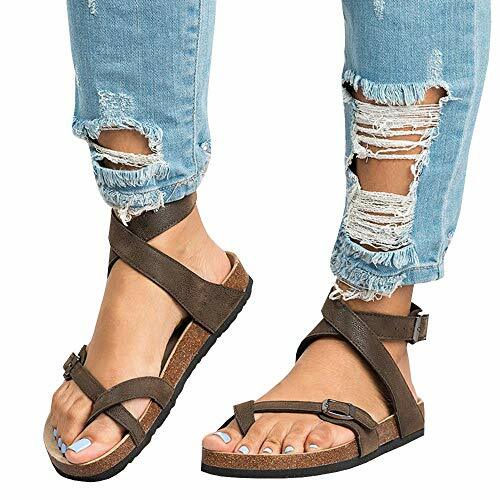 Ideal for the date, holiday, casual, daily and so on, they easily match your denim, shorts or skirts, while they take your dressy night looks to a whole new trendy level. 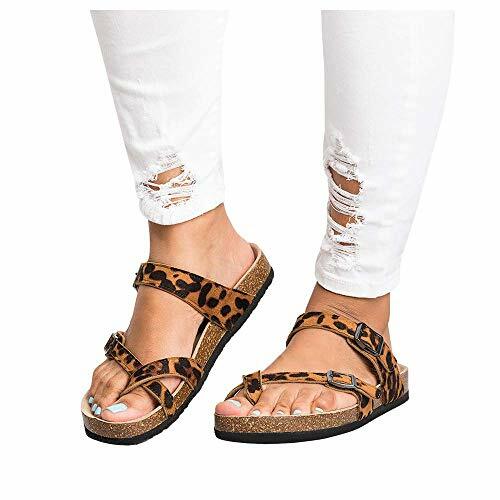 Features:●Upper Material: PU ●Lining Material: PU ●Outsole Material: TPR ●Heel Type: Low Wedge/Flat ●Heel Height: 2CM ●Closure Type: Buckle/Zip ●Color: Black, Coffee ●Season: Summer ●Occasion: Casual, Daily, SchoolSize Chart:6 M US =3.5UK= 246mm/9.68in 6.5US = 4UK=250.25mm/9.85in 7 M US =4.5UK= 254.46mm/10.01in 7.5US =5UK= 258.7mm/10.18in 8 M US =5.5UK= 262.92mm/10.35in 8.5US =6UK= 267.1mm/10.51in 9 M US =6.5UK= 271.39mm/10.68in 10 M US =7UK= 279.84mm/11.01in Note: Please refer to the Size Chart to find the correct size! Please don't mind a little slight color difference of pictures, becase of the light or screen effects! 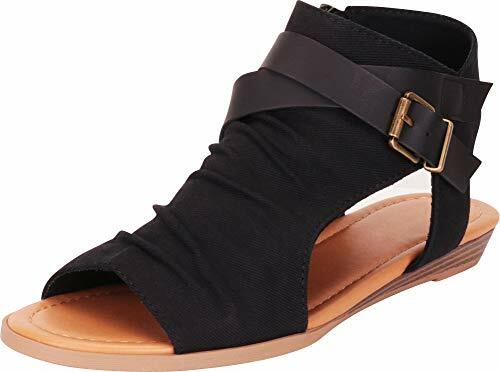 Ermonn Womens Thong Flat Sandals Gladiator Buckle Strappy Cork Sole Summer SlidesStyle: Casual, buckle strapHeel: FlatAttention: We can't guarantee the color that you see is the same of product because of monitor pixel definition and Lamp Light display.Size: Please measure your heel to toe length and choose the accurate size from the foot measurements.35EU--20.5cm (Foot Length)--5 US Women36EU--21cm (Foot Length)----6 US Women37EU--22.5cm (Foot Length)--6.5 US Women38EU--23.5cm (Foot Length)--7.5 US Women39EU--24.5cm (Foot Length)--8.5 US Women40EU--25cm (Foot Length)----9 US Women41EU--25.5cm (Foot Length)--9.5 US Women42EU--26cm (Foot Length)----10 US Women43EU--26.5cm (Foot Length)--10.5 US WomenShipping Info: Most items will be ship from US, the delivery time is 4-7 days. A few items will be ship from China by USPS, the delivery time is 15-30 days.About Ermonn: We are a professional wholesaler and exporter in China, we are committed to providing the best shopping experience and customer services. 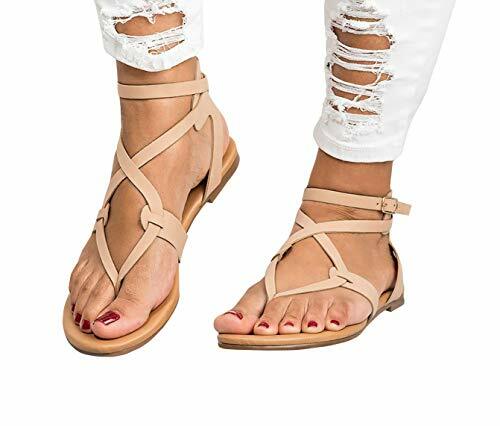 Ruanyu Womens Strappy Sandals Thong Cross Ankle Strap Buckle Slingback Flat SandalsMaterial: PU Leather and Synthetic SoleOccasion: Daily, Work, Party, Shopping, Hiking, Vacation, Etc.Color: Black, Sky Blue, Rose Red, Silver, Yellow and Khaki. PRODUCT DETAIL: Strappy SandalsAnkle Strap Buckle UpCross Thong Flip FlopSIZE TABLE:5 M(US size)--36 M(EU size)6 M(US size)--37 M(EU size)7 M(US size)--38 M(EU size)8 M(US size)--39 M(EU size)9 M(US size)--40 M(EU size)10 M(US size)--41 M(EU size)11 M(US size)--42 M(EU size)12 M(US size)--43 M(EU size)WARNING: Colors may differ from pictures due to lighting and screen display.If you have any question, please feel free to contact us, we will respond to you as soon as possible. 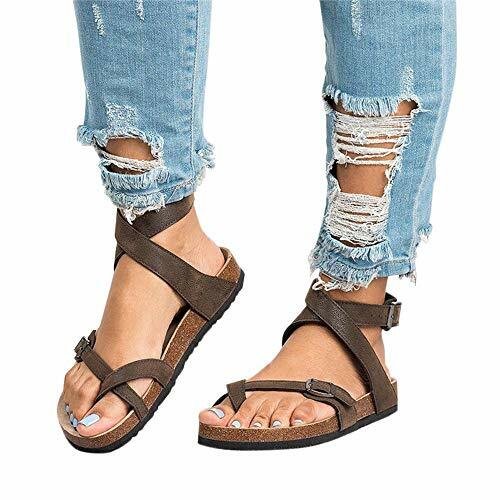 Ruanyu Womens Thong Gladiator Sandals Ankle Strappy Buckle Cork Flat SandalMaterial: Faux Leather and Cork SoleOccasion: Daily, Work, Party, Shopping, Hiking, Vacation, Etc.Color: Black, Brown, Beige. 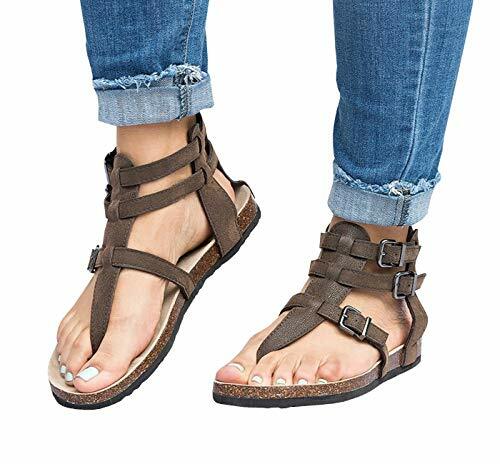 PRODUCT DETAIL: Strappy SandalsAnkle Strap With BuckleFootbed Cork SandalsCross Thong Flip FlopSIZE TABLE:5 M(US size)--36 M(EU size)6 M(US size)--37 M(EU size)7 M(US size)--38 M(EU size)8 M(US size)--39 M(EU size)9 M(US size)--40 M(EU size)10 M(US size)--41 M(EU size)11 M(US size)--42 M(EU size)12 M(US size)--43 M(EU size)WARNING: Colors may differ from pictures due to lighting and screen display.If you have any question, please feel free to contact us, we will respond to you as soon as possible. Shopping Results for "Buckle Gladiator Sandal"